They have quickly become my new favorite napkins. I love the texture they bring to the table. I like that little strip of plain trim at the bottom. I like the size at 12”x12”. I like that they are white and can be bleached. I really love that they are terry cloth and make cleaning up the inevitable spills super easy. I really super duper love that I can get six of them for $3.99 easily making these the cheapest cloth napkins I can find. When they get to worn/stained to grace my table I can demote them to cleaning duty. Did I mention they come in other super cute colors? There are some with a brown trim and some with a red trim (love these.) There is also a pack that has 3 different coordinating green cloths. They would look so cute for a summer table! 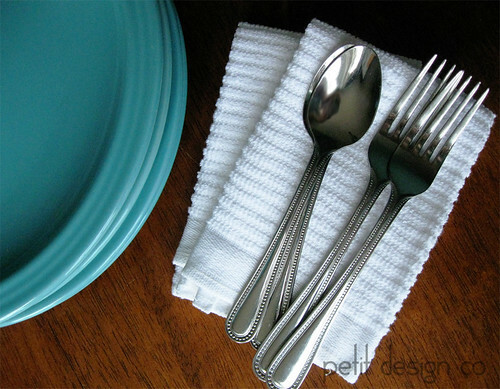 Do you use cloth or paper napkins? I saw some of these at the store the other day and wondered what I would do with them, now I know. At home I use cloth napkins. We have a small seasonal cottage, there I use paper. Not sure why I differ? Have a great weekend! It depends- I use cloth sometimes and paper other times.